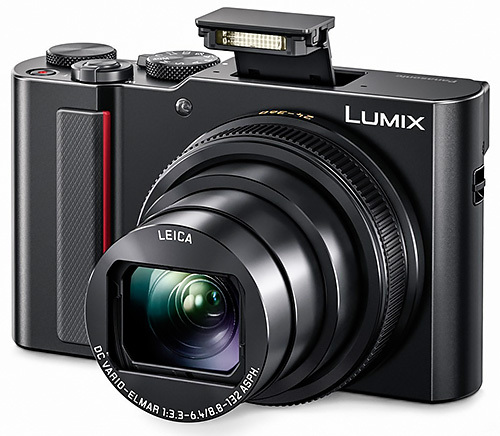 Panasonic has introduced the Lumix DMC-ZS200, its new flagship travel zoom, featuring a 24mm ultra-wide-angle Leica DC Vario-Elmar lens and enhanced 15x optical zoom (35mm camera equivalent: 24-360mm) with 5-axis image stabilization. Its 1-inch MOS sensor is paired with a Venus image processor to provide up to ISO 12,800. An upgraded Live Viewfinder integrates a new 0.21-in. 2,330K-dot equivalent LVF to provide a high magnification ratio of approx. 1.45x. The 3.0-inch LCD is touch-sensitive. 4K video recording features high-resolution QFHD 4K video in 3840x2160 at 30p or 24p in MP4. And 4K Photo lets you capture memorable moments by extracting single frames from 4K burst files shot at 30 fps to save as 8-megapixel equivalent images. Panasonic said the ZS200 will be available in gunmetal silver or black in mi-March for $799. Adorama and B&H are both now accepting pre-orders. NEWARK, N.J. -- Panasonic is proud to introduce the Lumix DMC-ZS200, the new flagship camera of the popular Travel Zoom series. The compact Lumix ZS200 comes with a 24mm ultra-wide-angle Leica DC Vario-Elmar lens and enhanced 15x optical zoom (35mm camera equivalent: 24-360mm). The camera also includes 5-Axis hybrid Optical Image Stabilizer Plus to suppress hand-shake in both photo and video recording. For added creativity the Lumix ZS200 integrates a new L.Monochrome mode in Photo Style for monochrome images with rich B/W film gradation. The camera's 1-inch MOS sensor produces high-quality images with stunning details. The combination of a High Sensitivity MOS Sensor and Venus Engine delivers up to ISO 12,800 for high sensitivity quality beyond the reach of most other digital compacts. And an upgraded Live Viewfinder integrates a new 0.21-in. 2,330K-dot equivalent LVF to provide a high magnification ratio of approx. 1.45x/0.53x (35mm camera equivalent). Both LVF and a 3-in. touchscreen display provide approx. 100 percent field of view. The Lumix ZS200 boasts exceptional optical performance with stunning clarity with minimum distortion and flare. This new lens system also enables stunning close-up shots with its 3cm macro capability. With the Lumix ZS200, 4K video recording is every bit as stunning with high-resolution QFHD 4K video in 3840x2160 at 30p or 24p in MP4. And 4K Photo lets Lumix ZS200 users capture memorable moments by extracting single frames from 4K burst files shot at 30 fps to save as 8-megapixel equivalent images. Auto Marking and Sequence Composition, included in addition to Post Focus and Focus Stacking, make 4K PHOTO even easier to use. A Contrast AF System features DFD (Depth From Defocus) technology and excels in both speed and accuracy for ultra-fast autofocusing in approx. 0.1 sec. The Lumix ZS200 includes Bluetooth and WiFi connectivity for a more flexible shooting experience and instant image sharing. Compatibility with Bluetooth 4.2 (Bluetooth Low Energy) enables a consistent connection with a smartphone or tablet with minimum power consumption. The Lumix ZS200 will be available in stores on March 20.There will be two colorways available: one in black and one in silver. Suggested retail price is $799.99. The Lumix ZS200 integrates Bluetooth and WiFi connectivity to offer a more flexible shooting experience and instant image sharing with easy operation. Once the camera is connected to a smartphone or tablet installed with the Panasonic Image App for iOS / Android, users can shoot, browse and share images remotely. They can also choose the quality of images to transfer using the Image App. Compatibility with Bluetooth 4.2 (called BLE: Bluetooth Low Energy) enables a constant connection with a smartphone/tablet with minimum power consumption. This activates the camera by simply using a smartphone/tablet or to automatically add GPS geotags on the photos. "AVCHD Progressive," "AVCHD," the "AVCHD Progressive" Logo and the "AVCHD" Logo are trademarks of Panasonic Corp. and Sony Corp.